There are a lot of threads relating to this error but none of those solutions worked for me. And, none explained why this error is here. I deleted everything in main.cpp except test code and excluded all source files except main.cpp; as expected it worked, so a small step in the right direction. The problem must be with one of the header files. why am I getting this error and what is the solution? What is your project type? If it's a "Win32 project", your entry point should be (w)WinMain. If it's a "Win32 Console Project", then it should be (w)main. The name _tmain is #defined to be either main or wmain depending on whether UNICODE is defined or not. If it's a DLL, then DllMain. The project type can be seen under project properties, Linker, System, Subsystem. It would say either "Console" or "Windows". Note that the entry point name varies depending on whether UNICODE is defined or not. In VS2008, it's defined by default. Make sure it's one of those. With UNICODE defined (which is the default), the linker expects the entry point to be wmain(), not main(). _tmain has the advantage of being UNICODE-agnostic - it translates to either main or wmain. Some time ago, there was a reason to maintain both an ANSI build and a Unicode build. Unicode support was sorely incomplete in Windows 95/98/Me. The primary APIs were ANSI, and Unicode versions existed here and there, but not pervasively. Also, the VS debugger had trouble displaying Unicode strings. In the NT kernel OSes (that's Windows 2000/XP/Vista/7/8/10), Unicode support is primary, and ANSI functions are added on top. So ever since VS2005, the default upon project creation is Unicode. That means - wmain. They could not keep the same entry point name because the parameter types are different. _TCHAR is #defined to be either char or wchar_t. So _tmain is either main(int argc, char **argv) or wmain(int argc, wchar_t **argv). The reason you were getting an error at _tmain at some point was probably because you did not change the type of argv to _TCHAR**. and remove the tchar.h include line. I had this error with a DLL after creating a new configuration for my project. I had to go to Project Properties -> Configuration Properties -> General and change the Configuration Type to Dynamic Library (.dll). So if you're still having trouble after trying everything else, it's worth checking to see if the configuration type is what you expect for your project. If it's not set correctly, the compiler will be looking for the wrong main symbol. In my case, it was looking for WinMain instead of DllMain. If you have a "Win32 project" + defined a WinMain and your SubSystem linker setting is set to WINDOWS you can still get this linker error in case somebody set the "Additional Options" in the linker settings to "/SUBSYSTEM:CONSOLE" (looks like this additional setting is preferred over the actual SubSystem setting. I had this error when accidentally putting the wmain inside a namespace. wmain should not be in any namespace. Moreover, I had a main function in one of the libs I was using, and VS took the main from there, what made it even stranger. I had this problem minutes ago. It went away when I added 'extern "C"' to the main() definition. Oddly, another simple program I wrote yesterday is almost identical, does not have the extern "C", yet compiled without this linker error. This makes me think the problem is some subtle setting to be found deep in some configuration dialog, and that 'extern "C"' doesn't really solve the underlying problem, but superficially makes things work. In my case, it's because I accidentally removed (not deleted) the stdafx.h and targetver.h files in the Header Files section. Add these files back to Header Files and the problem is solved. I just need to comment that (by prepending //) and it's good. I had this happen in Visual Studio 2015 too for an interesting reason. Just adding it here in case it happens to someone else. I already had number of files in project and I was adding another one that would have main function in it, however when I initially added the file I made a typo in the extension (.coo instead of .cpp). I corrected that but when I was done I got this error. It turned out that Visual Studio was being smart and when file was added it decided that it is not a source file due to the initial extension. Right-clicking on file in solution explorer and selecting Properties -> General -> ItemType and setting it to "C/C++ compiler" fixed the issue. I had the problem before, but it was solved. The main problem was that I mistakenly spell the int main() function. Instead of writing int main() I wrote int mian()....Cheers ! Set the system to console, following the previous suggestions. 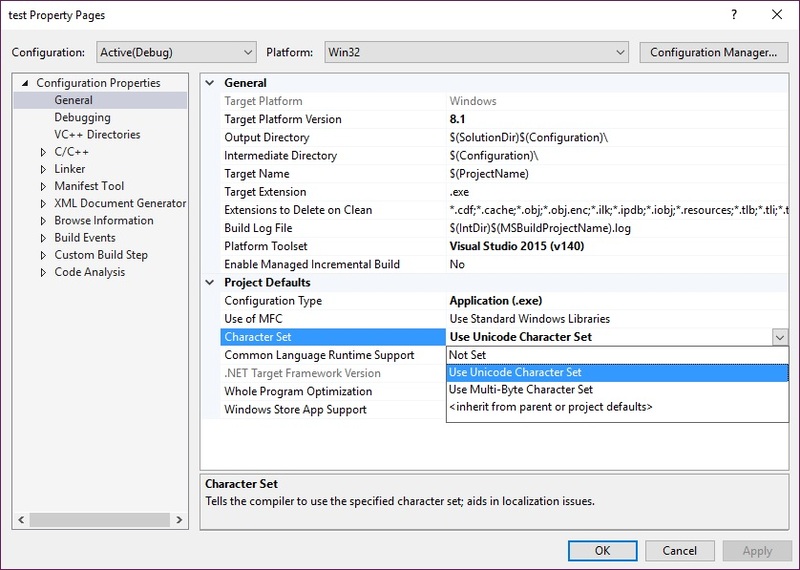 Only, also had to change the character set to Unicode, see the snapshot of Visual Studio 2015 above. Not the answer you're looking for? Browse other questions tagged c++ windows visual-studio-2008 windows-7 lnk2019 or ask your own question.